For some of our reports, we have used Tableau visualisations to illustrate the data we have collected during our audit work. Spending and performance of services for individual councils, and public satisfaction with services. Councils' income, reserves and levels of debt. Trends in activity and demand, key performance standards and rates of sickness absence and turnover. Make-up of the student body, attainment and retention levels and destinations for students. Councils' income, reserves and revenue costs of general fund borrowing. Expenditure and cost pressures, demand for NHS services, overall performance standards and key public health indicators. 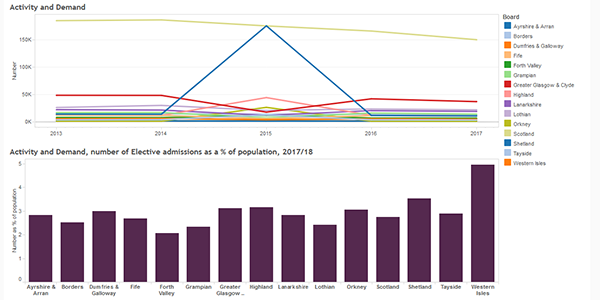 Passenger and vehicle numbers for individual ferry routes, along with statistics on reliability and punctuality for ferry routes in Scotland. The 2017 overview of colleges in Scotland updates income and expenditure sources, the student population make-up, and attainment and retention levels from 2016. How councils spend across different service areas, comparing individual councils with others in the rest of Scotland. Information about Scottish health boards' expenditure and savings, and performance and workforce indicators. An overview of colleges in Scotland including income and expenditure sources, the student population make-up, and attainment and retention levels. The condition and state of trunk and local roads in Scotland. Councils' individual project status and capital spend.